Miguel Cabrera, legendary first baseman for the Detroit Tigers, surprised everyone – or no one at all, depending on who you ask – by announcing that he had right ankle surgery to remove the bone spurs which dogged him all season, and to repair a stress fracture of the navicular bone. The navicular bone lies on the top of the foot near the front of the ankle, and plays an important role in maintaining the arch of the foot. If you’re a baseball fan, you no doubt heard that Cabrera struggled with these injuries the second half of the season this year, even though he hit .313 with 25 home runs, and 109 RBI’s (that’s a crap season for Cabrera, even though anyone else would be breaking out the Cristal and re-negotiating their contract with those numbers). By comparison, in 2013 Cabrera hit .348 with 44 home runs and 137 RBI’s, which won him his second consecutive American League Most Valuable Player award. By the end of this season however, Cabrera could barely run on the ankle due to the excruciating pain. 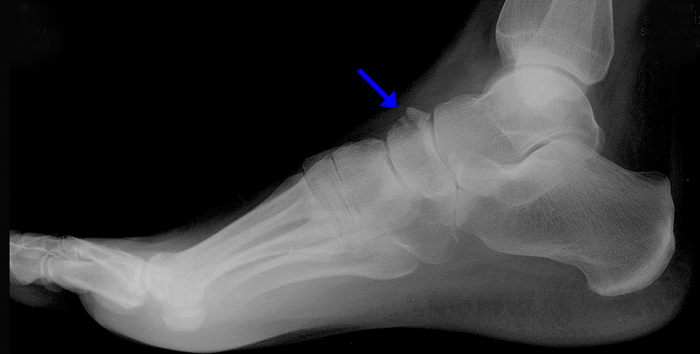 Arrow points to the Navicular bone. Cabrera’s ankle will be reevaluated in 3 months, late in January, just a few weeks before the Tiger’s spring training is to begin.